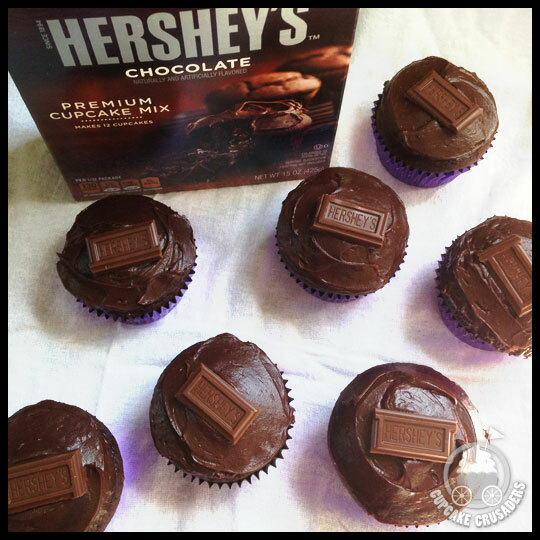 Oh Hershey’s… How I love thee… but not this time. 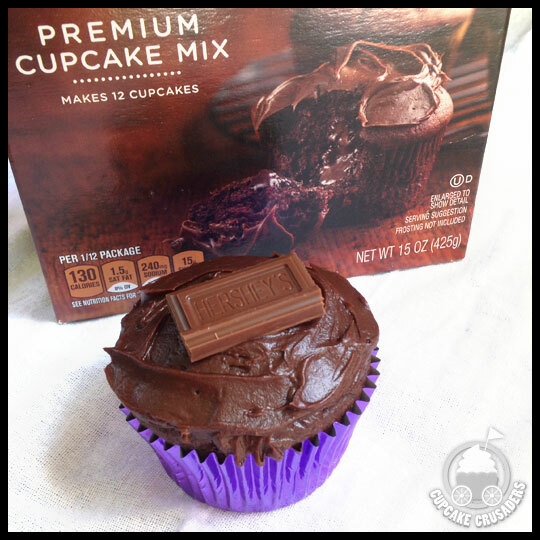 I recently purchased two boxes of Betty Crocker Hershey’s cupcake mix on sale because, let’s be honest, how can you pass up a deal that includes cupcakes and chocolate? 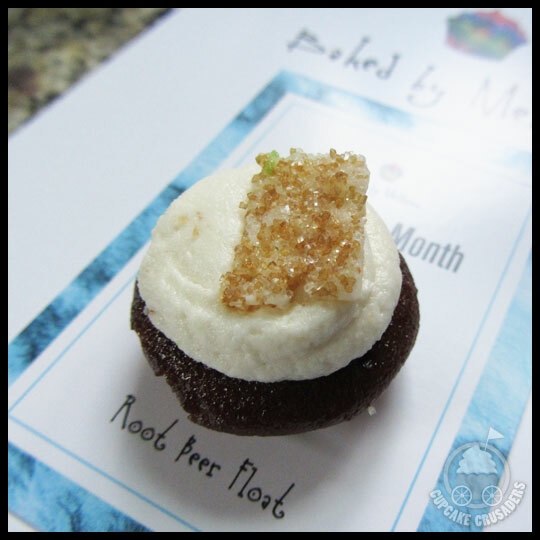 Each kit included the cake mix and filling for a dozen cupcakes, and the S’mores kit even included the crushed graham cracker for the base. Sadly, the cake for each cupcake was not good at all. It wasn’t that it was just bland, but it kind of tasted like what I imagine cardboard would taste like. I think if I had added pudding and chocolate chips it would have greatly improved the flavor. On the bright side though, the process for making these cupcakes was extremely easy. I haven’t made cupcakes yet that you bake the filling in the center of the batter, but it worked out really well. Some of the filling in the Hershey’s Chocolate cupcakes did explode a little out of the top of the cupcake, but luckily it wasn’t too bad. I would only buy this cake mix again if I intended to modify it. Adding some pudding mix and chocolate chips would only take a few extra seconds and I think the results would be so much better. 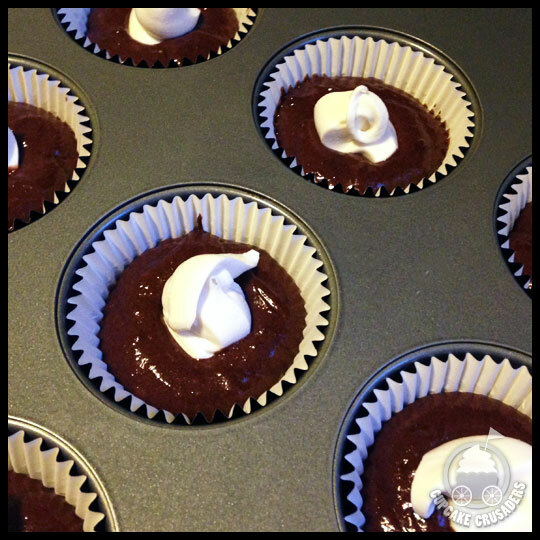 What would take these to the next level even more, would be to use your own favorite dark chocolate frosting recipe, or modify store-bought chocolate frosting, as we have done before here. Even though these cupcakes didn’t turn out as I was hoping, I’m still a box mix girl and probably always will be. I’ll leave the from-scratch baking to the pros, but I have definitely learned that adjusting a box mix is the way to go. 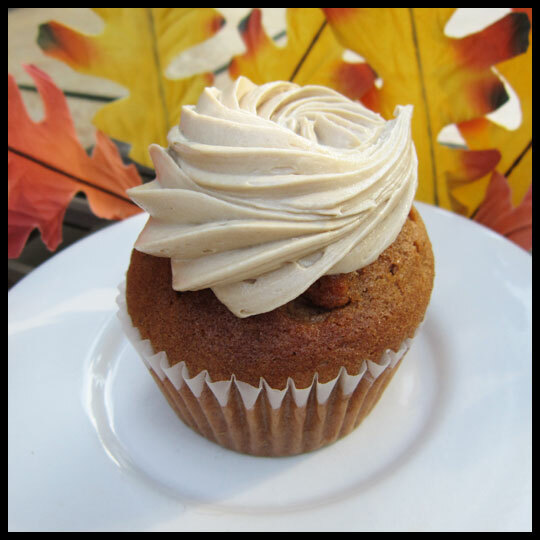 Fall is in full swing and it is officially pumpkin season. 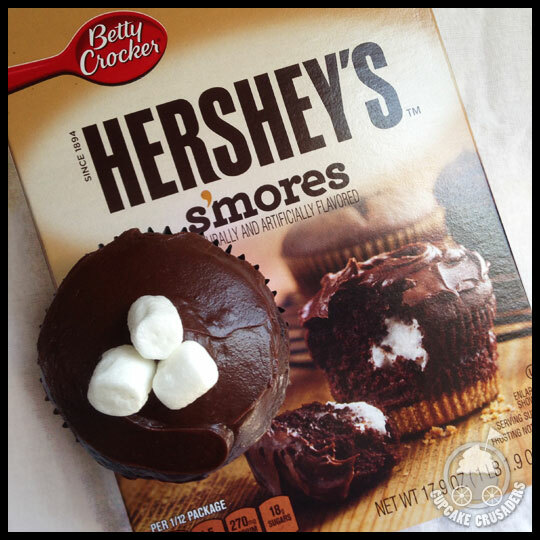 With these cool fall days I can’t help but think of toasting marshmallows by a campfire and making s’mores… What could be better than putting those ideas together for my next cupcake experiment? Ok, I’d love to claim this as my idea, but really it was Crusader Stacy’s. While away on our annual girls trip we were chatting about what kind of cupcake I should make and it all came together. Every year I make pumpkin pancakes on our trip and Crusader Stacy is our s’mores queen. BAM! An idea was born. And it might be my best cupcake yet! After doing my usual research I settled on these recipes: a graham cracker crust, pumpkin pie spice cake, marshmallow fluff filling, chocolate buttercream with marshmallow fluff edge frosting, and crumbled graham cracker crust sprinkles on top. 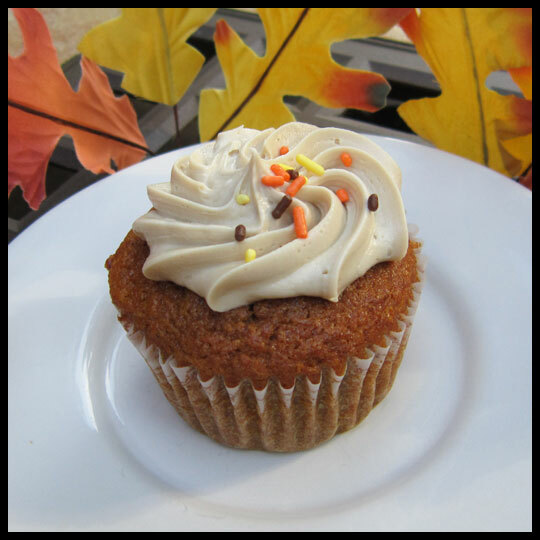 Two of my favorite things put together created the perfect fall cupcake AND it was SO good. 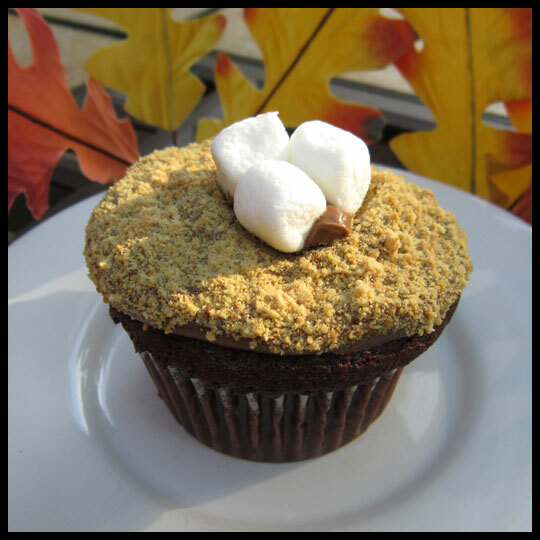 The graham cracker crust added a flavor and texture that helped make this cupcake truly taste like a s’more. The cake was moist, spicy and didn’t turn out muffiny (which some pumpkin cakes do). The frosting was smooth and, considering it was my first chocolate buttercream ever, it might be the best frosting I have ever made. 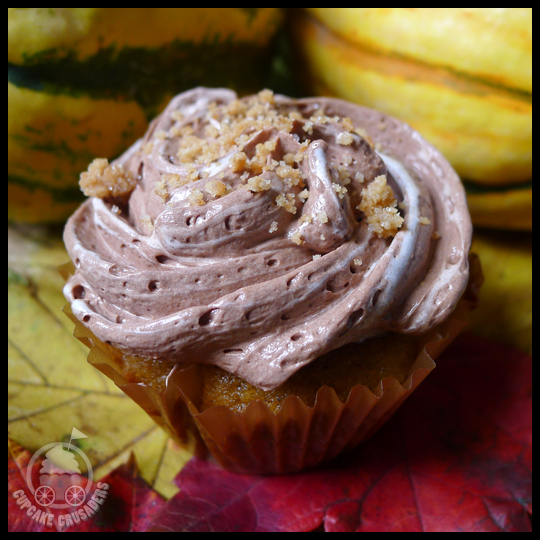 I baked the leftover crust ingredients and crumbled it on top – that pop of crunch was the perfect way to finish this cupcake. I did run into a couple of issues with this baking experiment. The first being that the cake recipe made many more than the 18 that was stated. Granted I had graham cracker crust in the bottom, but after making 2 dozen cupcakes, I had enough batter left over to make at least another dozen. The other issue I ran into is the marshmallow fluff edge on the frosting. I thought it would be as simple as lining the pastry bag with fluff, adding the frosting and presto. Well, not so much. Lining the pastry bag would have worked had I used two types of frosting, but the fluff was a bit too sticky and didn’t line the edges of the chocolate buttercream the way I wanted. It still looked cute and tasted great, so this was only a minor bump in an otherwise smooth baking road. Overall this cupcake was a total baking success. 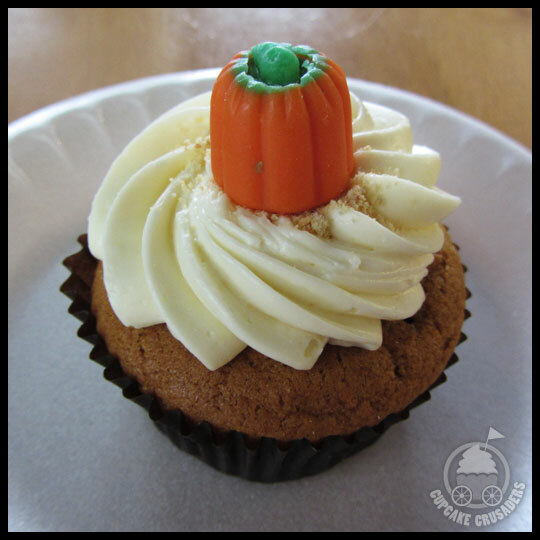 Sweet, spicy, chocolatey, and with the perfect amount of pumpkin, this cupcake concoction embodies its namesake campfire treat. I’m so glad our girls trip inspired such a fun and interesting baking experiment. 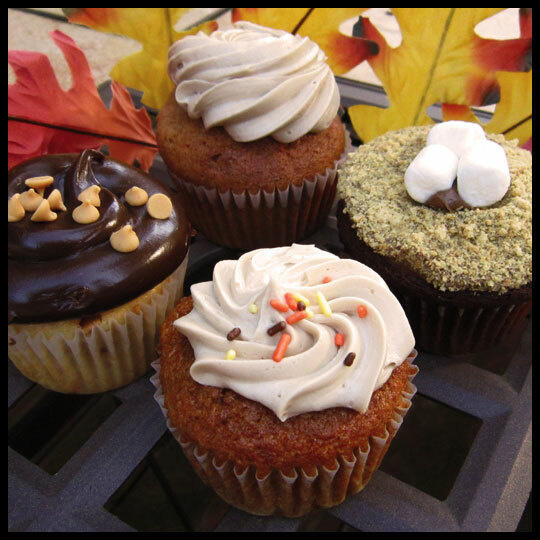 Who knows what we’ll come up with for my next flavor – if you’ve got an idea for an interesting (and filled) cupcake that you’d like me to make, let us know below! 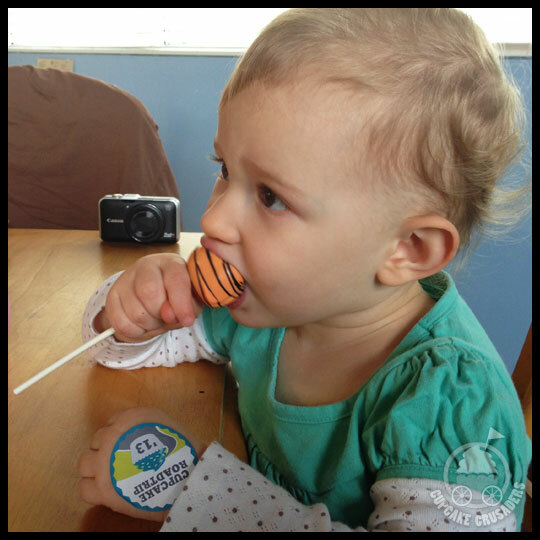 We have another new guest reviewer! Our good friend Ashley recently graduated from Lynchburg College and spent her entire last semester sending us photos of all the cupcakes she encountered while there. 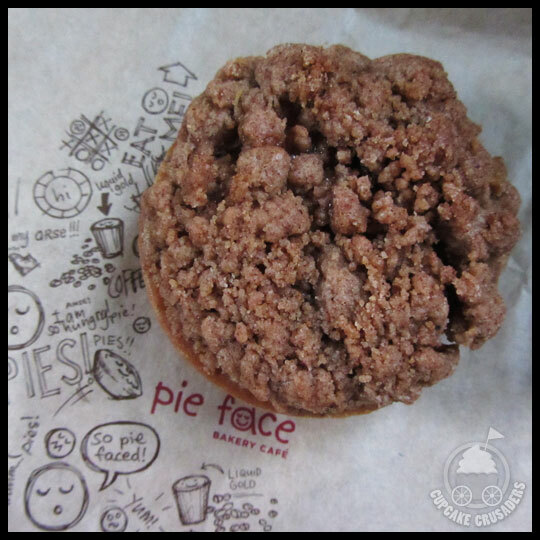 Since her classes kept her busy, she wasn’t able to write up a review for us while she was there, but now that summer is in full swing she took some time to share her experiences with us! 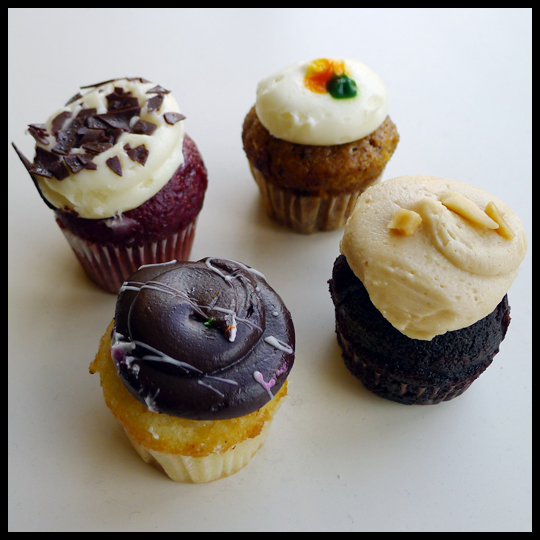 In this first review she chronicles the cupcakes she tried from one specific location on campus. Thanks Ashley! I must admit that when Jenn, Stacy, and Elisa started talking about cupcakes all the time I never thought that it would escalate to the creation of this awesome blog that I enjoy following so much. 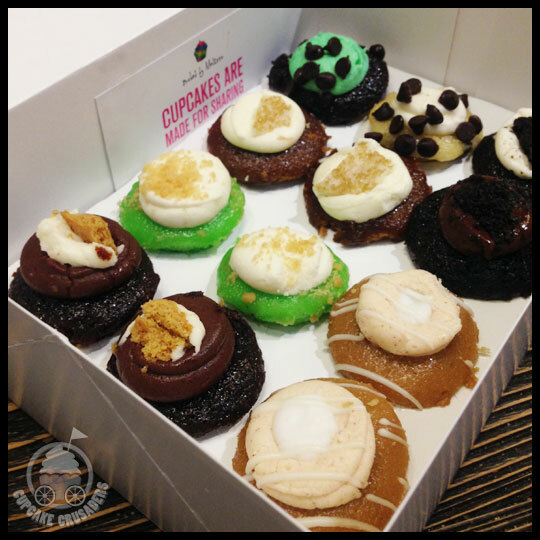 Cupcakes really are the perfect sweet for me because they are generally pretty small so they are the perfect size for someone who wants to limit his or her sweets intake (like me). While I am nowhere near the cupcake “expert” that the Crusaders are, I have since started eating cupcakes more frequently and find myself capturing the moment in a photo each time to share with the Crusaders and give them my own personal thumbs up or down. 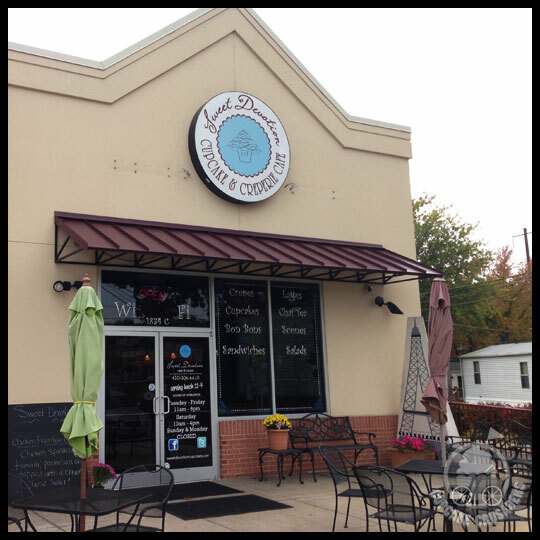 I recently graduated from Lynchburg College, a small liberal arts college in Lynchburg, Virginia and during my last semester there I often visited Brewed Awakenings, the coffee shop located in the building where I worked. 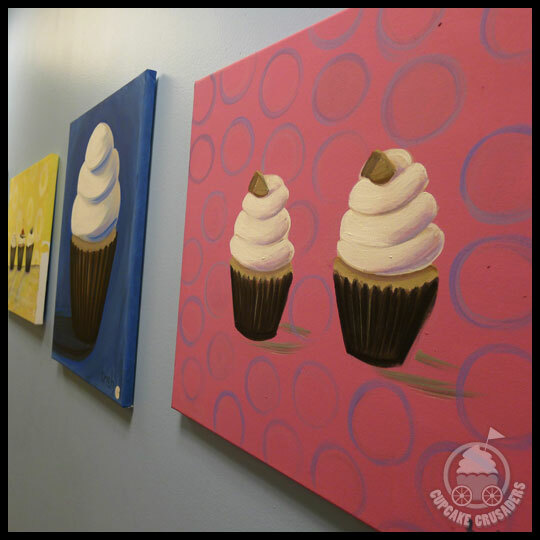 One day, while I waited in line I noticed some amazingly delicious looking cupcakes. My initial thought was, “Brewed has cupcakes now! 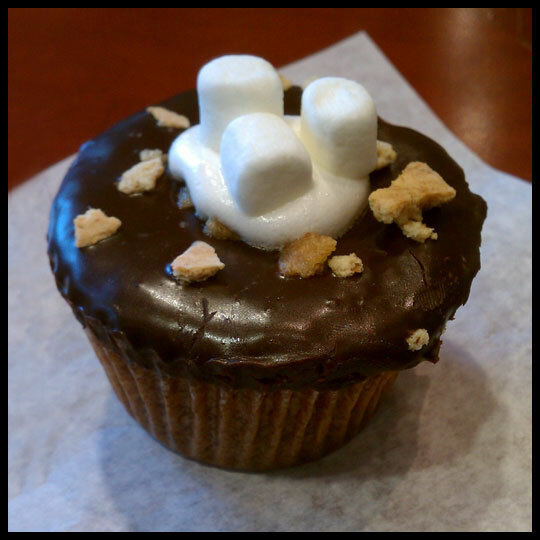 ?” – this is when I knew the cupcake phenomenon had reached Lynchburg and I couldn’t resist buying one to see if they were as good as they looked. 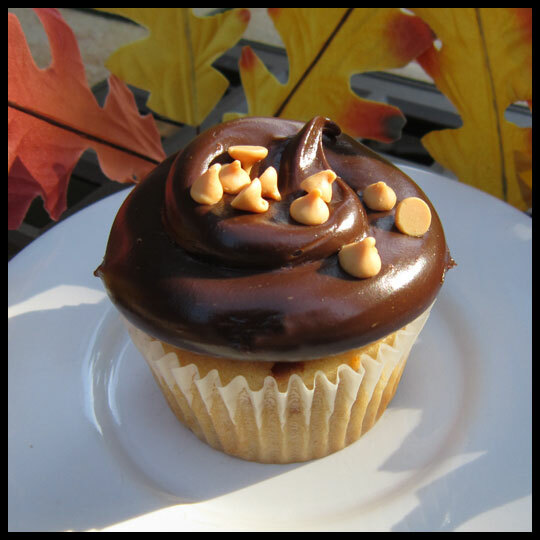 One of my favorite flavor combinations is peanut butter and chocolate, something I share with Crusader Jenn’s husband, so without hesitation I chose their Peanut Butter and Chocolate cupcake. I took just enough time to take a picture of it before I rushed to work with my cupcake so that I could dig in. Considering this was the first cupcake I got from Brewed Awakenings I was not quite sure what to expect. After the first bite, however, I was completely sold. This cake was so moist and complemented by the peanut butter frosting and topped off perfectly with a piece of a Reese’s Cup, my favorite candy. 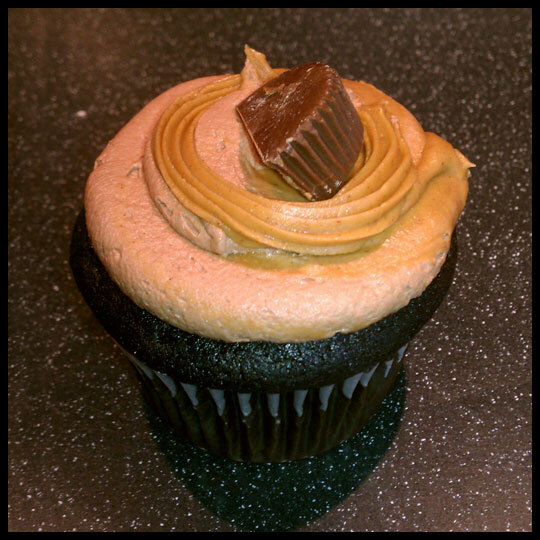 The flavors blended well and completely satisfied my peanut butter and chocolate addiction. 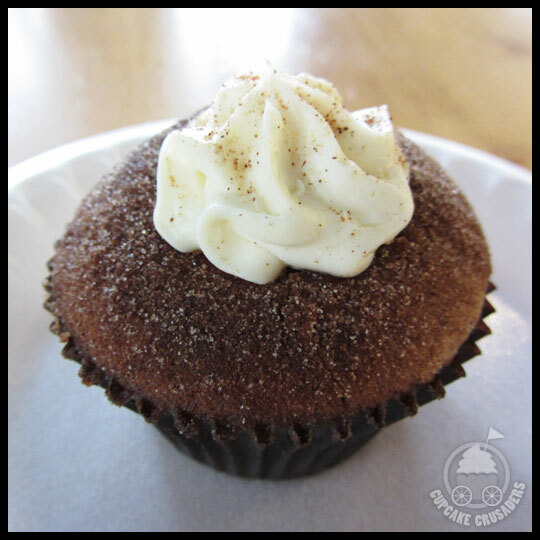 This cupcake was just as, if not more, moist than the peanut butter and chocolate cupcake. I was originally not sure what to think about key lime because I have not had much of it in the past, but the woman working behind the counter insisted it was delicious so I took her word for it. She was certainly correct! The cake was moist and had the perfect amount of lime mixed in with it and the frosting was delicious with specks of lime sprinkled on top of it. 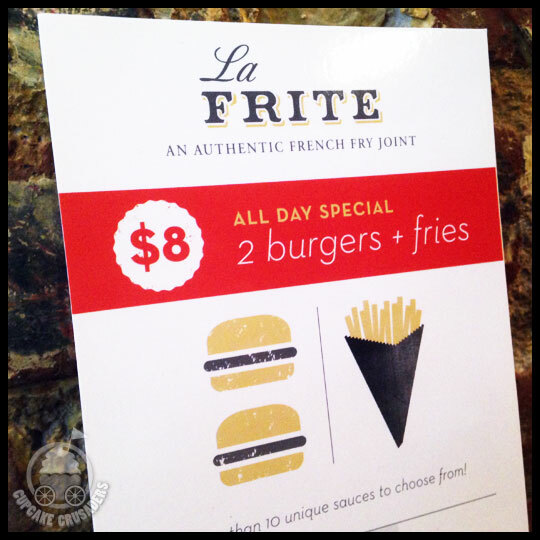 Yet again I was completely sold! 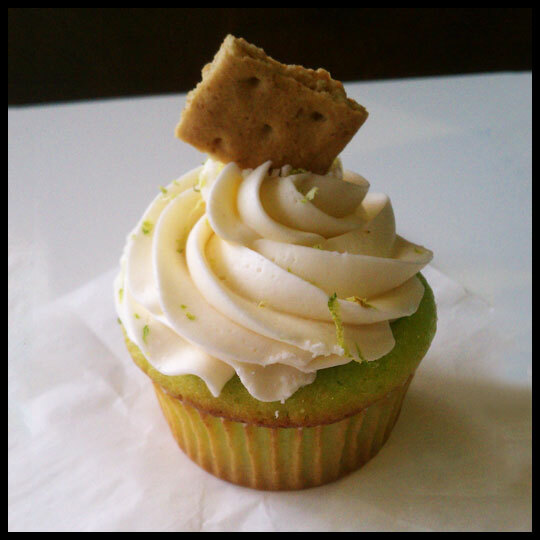 I would definitely recommend that, if you have yet to do so, you try a key lime cupcake next time you see one! 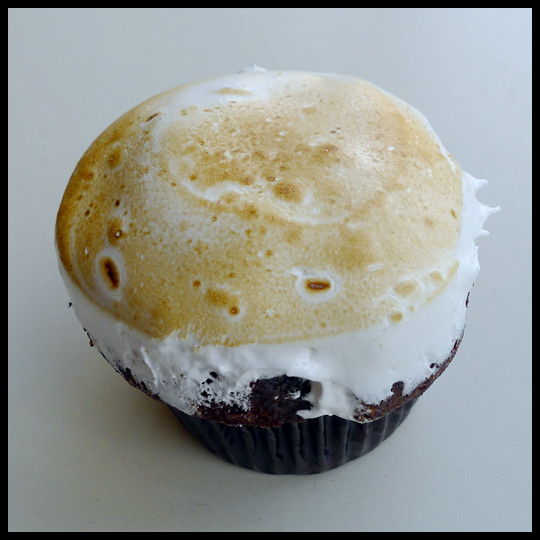 I love s’mores so words cannot express how completely excited I was about this cupcake. 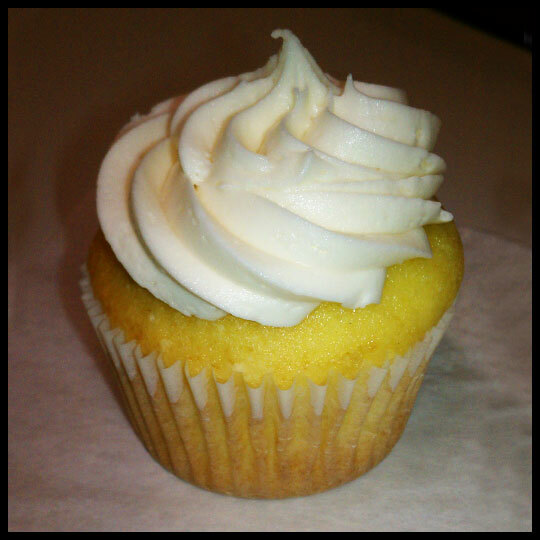 Just looking at this cupcake my mouth started watering. 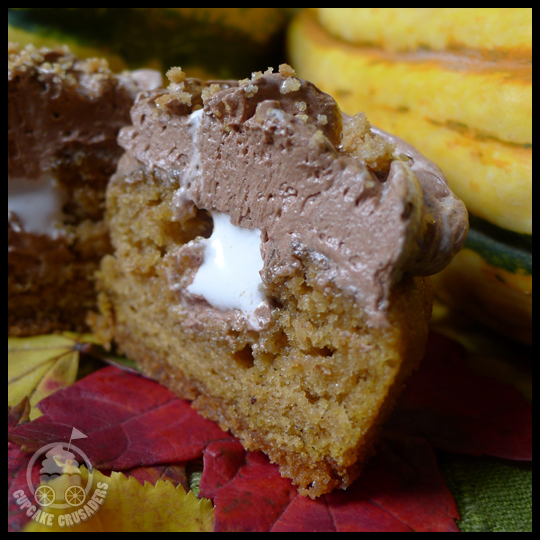 The frosting with the graham cracker sprinkled on top of it with the mini marshmallows looked so delicious. Maybe it was the mental build up, maybe it was the fact that the past cupcakes were so good, or maybe it was a mixture of the two but I was sadly disappointed by this cupcake. The frosting and everything on it tasted fine and made the cupcake edible but the cake portion of the cupcake was very dry and resembled corn bread texture (which was surprising based on how moist the past cupcakes were). This was very disappointing especially because I am not a big fan of the texture of corn bread. 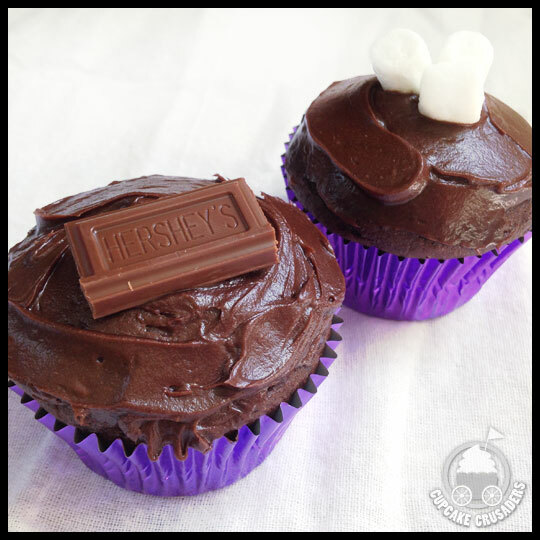 Perhaps if the cake portion of the cupcake was a little better it could be a totally different cupcake, but I definitely need to try a good s’more cupcake sometime to alter my current opinion on them. Following my disappointment from the s’more cupcake I was a little nervous but I dug in anyway. 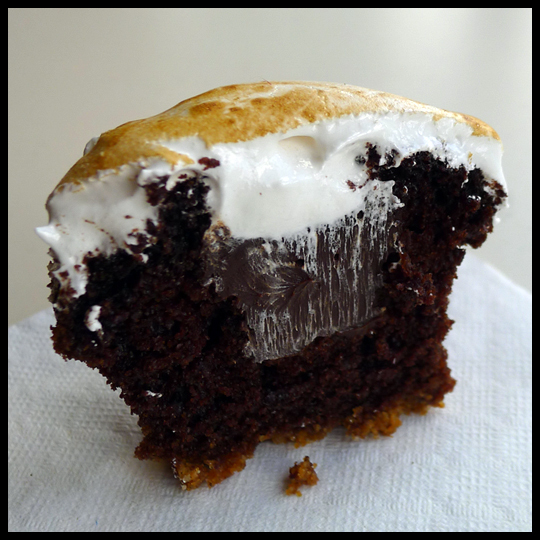 I was relieved when the cake was more moist than the s’more cupcake, although not as moist as the peanut butter and key lime cupcakes. 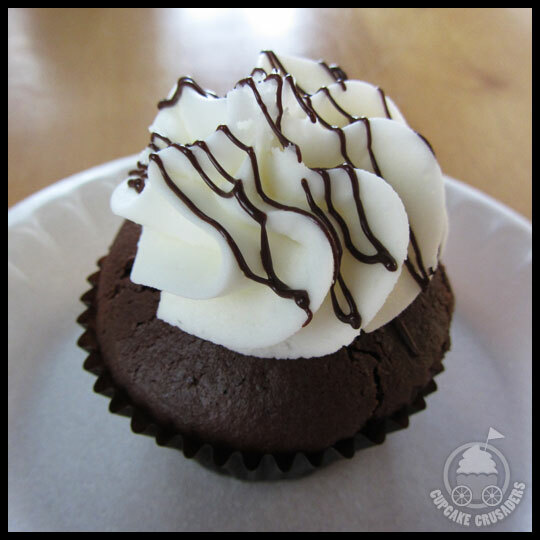 This cupcake was exactly like a peppermint patty with the chocolate covering and the peppermint filling frosting. 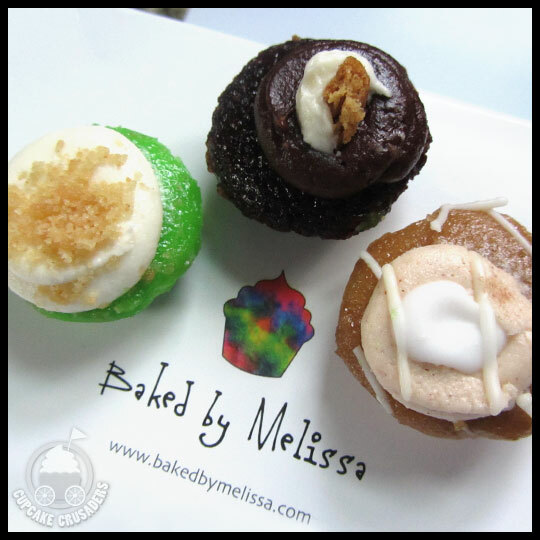 The flavors all blended really well together and made for a very nice redemption cupcake. The only minor complaint that I have about it is that it was extremely sweet; however, in my opinion, peppermint patties are also extremely sweet so I suppose it was very fitting. These two are some of the less memorable cupcakes. They weren’t horrible but they also didn’t stand out to me as fantastic either. I wish I were able to tell you who brought these cupcakes to Brewed Awakenings; however, every time I asked the workers behind the counter they did not seem to have an answer for me. The closest thing I got to an answer was that they were delivered by a personal baker who only operates from her house and does not have an actual bakery. If I find out any additional information I will be sure to update everyone! Our Healthy Guest Crusader and my co-worker, Rebecca, often surprises me with fun things, like a high heel shoe tape dispenser… but the best surprises are always cupcakes! Last week, while on a trip to DC, she was kind enough to buy me cupcakes from Sprinkles and Bittersweet Bakery! Knowing my love for Sprinkles, she stopped by and got me two cupcakes she knew I had been dying to try, their Cherry Blossom and S’mores cupcakes. Cherry done right! This cake has cherries puréed in both the icing and the cake! The icing was sweet, pink, and very cherry, while the cake actually tasted more almond to me and had a lovely blue/pink/gray color. 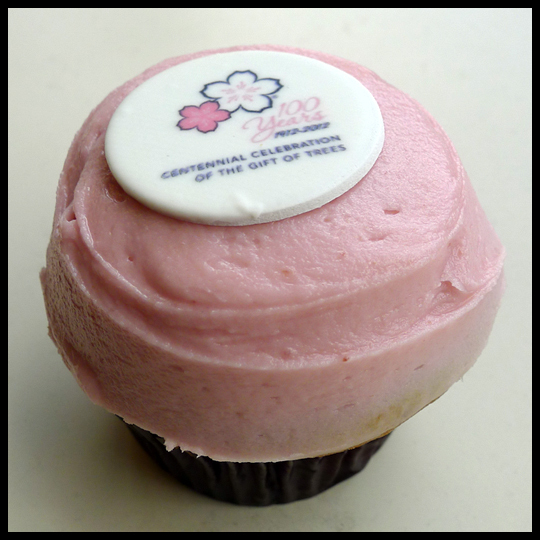 This cupcake celebrates the beautiful cherry blossom trees just perfectly. 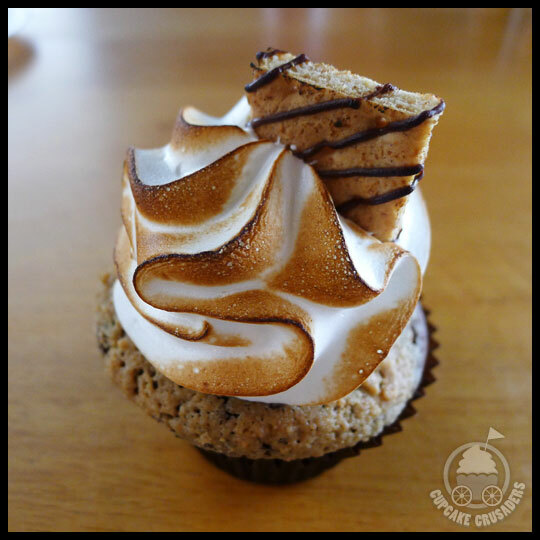 Graham cracker lined bottom with gooey chocolate ganache filling, and toasted marshmallow on top really embody a s’more in cupcake form. The crust stayed crunchy and buttery too, which has to be a difficult challenge when you are putting cake batter on top. 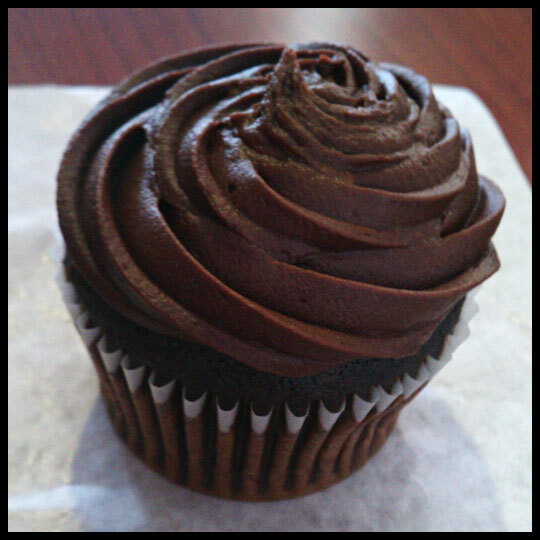 I don’t always love chocolate cake, but this cupcake really let each flavor shine, making it a chocolate cake I would always order. Sadly, S’mores is only offered a few months out of the year and the next time it will be around is next fall. I can’t believe I will have to wait that long to get one again! 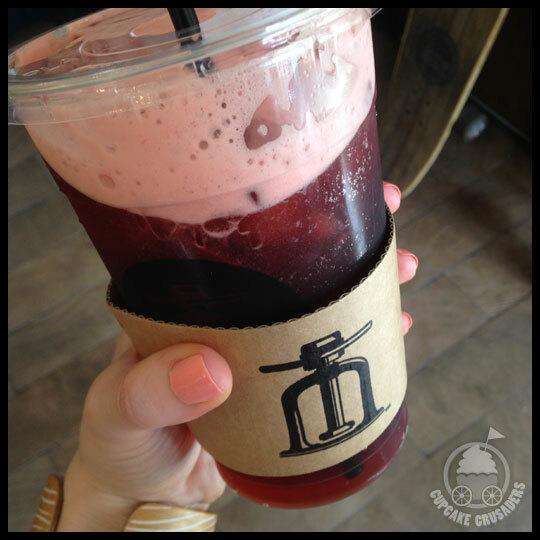 What a peanut butter punch! This little deep dark chocolate cake was topped with the most savory and delicious peanut butter frosting. I mean, WOW, it was that good and I would love to have a full size cupcake of this flavor! This little cupcake looked better than it tasted. The cake was oddly oily, and while the chocolate ganache topping was yummy, it did not save this cupcake from being mediocre. Maybe their full size cupcake would be different, but it would be tough to get me to order it, especially knowing how good some of the other flavors are. Knowing how much I love red velvet (when it’s done right), Rebecca made sure to include this one for me. However, as can often be the case with red velvet, this cupcake was disappointing. The cream cheese icing was just okay, and the cake was very dry. 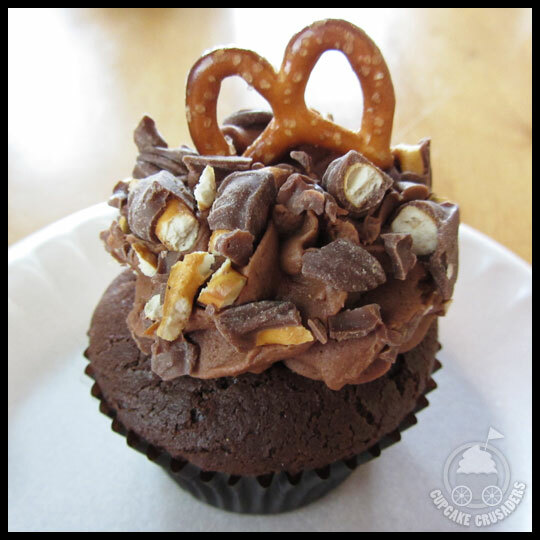 I love the chocolate shavings on top though; what an interesting and delightful treat, sadly, the only treat about this cupcake. Rebecca warned me about how much I would love this cupcake, and boy was she right! The very moist and spicy cake was full of carrot and raisins. The cream cheese icing (which I swear was not the same as the icing on the red velvet) was perfect and smooth. 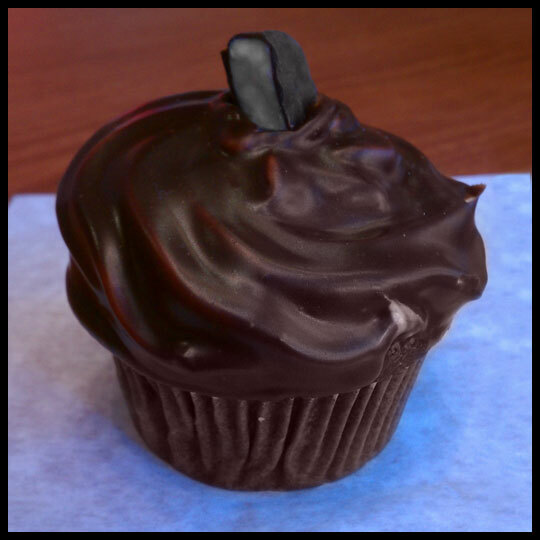 My one problem with this cupcake is how small it was… all I wanted was more of it!